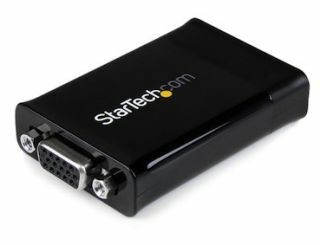 StarTech.com has released the MCHD2VGA – an HDMI/HDMI Micro to VGA Adapter, which enables users to connect an HDMI or HDMI Micro-equipped mobile device, such as a tablet computer or Smartphone to a VGA display or projector. The adapter provides a cost-effective alternative for users who need to integrate their mobile multimedia source to existing display devices, eliminating the expense of equipment upgrades, according to the company. The HDMI/HDMI Micro to VGA adapter includes an HDMI to HDMI Micro cable required for connecting HDMI Micro devices to the adapter which interfaces with the VGA display/projector. The adapter supports full 1080p output, which allows users to suitably display their high-definition or high-resolution content. The MCHD2VGA HDMI/HDMI Micro to VGA Adapter is available now. MSRP for this product is $78.99 (USD) in the United States and $80.99 (CDN) in Canada.